Julie Malliari is entering a new high school as a senior and quickly befriends Tabitha. Before you know it they're starting a band but Tabitha's rival is determined to derail her dreams. It's a familiar rock and roll origin story but it's fun and beautifully put together. 'We Are The Danger' may remind you of a line from 'Breaking Bad' but it's actually a fast-paced and lively story of teens putting a band together. The comparisons to Archie Comics' 'Josie and the Pussycats' and 'The Archies' will be inevitable but should be seen as a compliment. Writer and artist Fabian Lelay, colorist Claudia Aguirre, and letterer Taylor Esposito achieve a level of charm, chemistry, and camaraderie in a first issue that is rare. Julie is a regular teen trying to make the best of a new school when she's approached by the effervescent Tabitha and invites her to a rock she's playing. Once there, she catches her performance and flirts briefly with a guy. After an awkward first day among strangers at school, things appear to be picking up. Tabitha and Julie strike up an instant friendship and eventually form a band of their own. It brings Julie out of her shell, revealing a talented singer-songwriter, and soon the other members are chosen. They quickly develop a nice rapport with each other exposing a little personality of each. Lelay uses some brief but effective character moments to help shape who these kids are. It's a swiftly paced issue so these moments come quickly but the Lelay's expressive character designs work hand-in-hand with the dialogue creating a sort of short-hand that conveys a lot within just a few panels. What separates 'We Are The Danger' from more familiar fare is that Julie is a Filipina. I only mention it because it's so rare to see Americans of Filipino descent represented in comics. Yet, Lelay seamlessly introduces her and offers a glimpse into her culture through her music. It's really that easy to include some real-world diversity in your form of entertainment. There is something unique about a writer/artist doing double-duty on a comic especially a creator-owned one. There is an intimacy, an attention to detail, and a pursuit of perfection writer/artist's strive for when they're responsible for the story in words and images. Lelay's style is very clean and spacious. The panels seem to be given plenty of room for the characters to breathe and laid out with letterer Taylor Esposito in mind. The lettering is crisp and clear with room to spare and creatively used to add some punch to the action and music. Claudia Aguirre's colors are rich but bright providing a rainbow of colors. 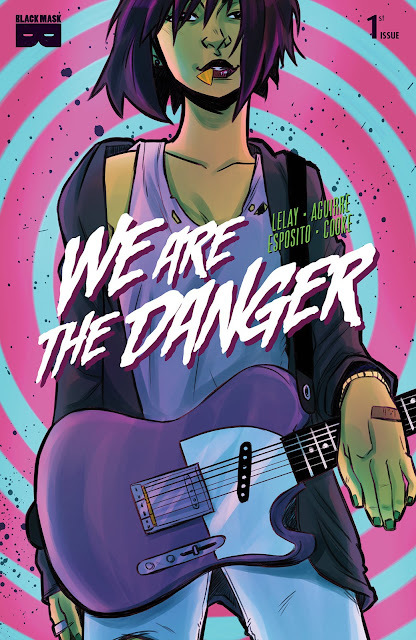 'We Are The Danger' is a fun and light rock and roll story with a charming and diverse cast of characters. This is Black Mask Studios' 'Josie and the Pussycats' in the very best of ways. Lelay brings this budding group of teen rock stars together in a familiar but entertaining rise to stardom story. It's the perfect comic book series for the summer.